Lord Ganapati (Ganesha) 108 Names and English Meanings. Lord Ganesh is one of the most worshiped God by Hindus. Ganesha is regarded as the Remover and Obstacles and the Bestower of Success. It is believed that one should worship Lord Ganapati before he/she start any new jobs, so that there will not be any obstacles with the grace of Ganesha. Temples of Lord Ganesha is found all over India and even in western countires. One can also see an idol of Lord Ganesh in almost all temples even though the main deity of the temple may be any other Hindu God. That means, Lord Ganesh is always worshipped first to get rid of the obstacles in Life. Ganesha is known by different names including Ganapati, Vinayaka, Pillaiyar, Ganesh, Vighnesha. Given below are the Hundred and Eight (108) names of Lord Ganesh with meanings. By whose puissance this world of illusion is mainfest, whose creation is this universe, who is the Lord of all gods and creation, he is the Eternal, Lord Ganesha. Ganesha is the embodiment of 'OM', the symbol of the Great God. He is the Eternal Spirit, the Beginning of all beginnings, beyond comparison. As a rotund, elephant-faced figure, Lord Ganesha is the Lord and Master of the whole earth. He is the protector of the visible world and leader of the helpless, destroying all evil and obstacles. The massive Lord Ganesha reposes on the jewelled throne with the snare, the hamulus and the lotus flower in his hands. On his forehead r poses the moon. He is four-armed, has a single tusk, a trunk askew, a potbelly and he is gigantic. Bhoovanpati is the Great God Himself to whom even the Trinity - Vishnu the Protector, Shiva the Destroyer and Brahma the Creator - pay obeisance and propitiate Him to save the world from evil. Buddhipriya, the repository of knowledge, bestows guileless discretion to the worshipper. As ruler of the Mooladhara Chakra or plexus, he arouses a person's latent energy or fife force to take him to the Divine Light. By chanting Lord Ganesha's name day in and day out, one gets richer by imbibing all knowledge and wisdom from him, who is of enlightened heart and unwavering wisdom. Lord Ganesha, Protector of the gods is their beloved. With a large form, who has the mouse as his vehicle, he is the embodiment of peace and tranquillity-the giver of peace to all. The Great Lord Ganesha is gentle, forgiving and compassionate- ' He likes to prod man with his goad to the path of righteousness and truth so that he can learn to be charitable. The smoke-hued Ganesha is the beloved Lord of gods and mortals. His body is sometimes compared with a red lotus. His hands are ornamented with gem-studded bangles and his whole smoke-coloured image is enchanting. Ganesha, the elephant-faced, pot-bellied Lord is Infinite Strength and Power personified. He is deathless, has no beginning or end - he is invincible. Goddess Parvati created~ a child from the perspiration that came off her body. She lowered him into the River Ganga and he grew into a large being. Both Parvati and Ganga claimed to be his mother. Lord Ganesha is the symbol of a single syllable 'OM', the symbol of the Great God. He is also known as Pranava, the sound from which the world emanated. The single-tusked Ganesha stands for one direction. He gathers information from various directions, but having decided his course of direction, he does not waver. The single tusk represents the non-dualistic nature of reality. The elephant-faced Lord Ganesha is one-tusked, has a large, body with a huge belly, and is capable of destroying all obstacles'. Ganesha with his twisted trunk is symbolic of his vast knowledge and powers of discrimination, vital for spiritual progress. The curved trunk is shaped like 'OM' also symbolic of the life force energy. Lord Ganesha is the Lord of the gods and is the beloved of all. As the Chief and Supreme God among gods', he is worshipped by all. Gauri is another name of Goddess Parvati. Gaurisuta is Lord Ganesha, the deft son of Gauri. He enlightens and causes his mother's face to blossom with his love and devotion. Lord Ganesha is Heramba, the fire-headed Protector of the weak. He is his mother's beloved, and is her protector. Constant and regular chanting of Lord Ganesha's name is a sure path for atonement of sins. He is the abode of forgiveness, the seat of compassion, and most forgiving. Repose faith in him and he will protect you. Lord Ganesha, the Almighty, the Supreme Infinite, is omnipotent and all powerful. His infinite form is beyond man's comprehension, and is limitless. Lord Ganesha is the God of all people, big and small, educated and illiterate. He is compassionate and forgiving, wise and intellectual. With his huge body, gentle eyes and calm countenance, he fills one's heart with love. The Infinite Lord Ganesha has no beginning or end. He is deathless and the root cause of the creation. He is the embodiment of 'OM', the symbol of the Great God who has no end and is invincible. Lord Ganesha, the repository of knowledge, is adorable, with his plump body, his tusk broken and single. His is the Lord of all wealth-material as well as spiritual-endowed with intrinsic qualities that command the respect of all. 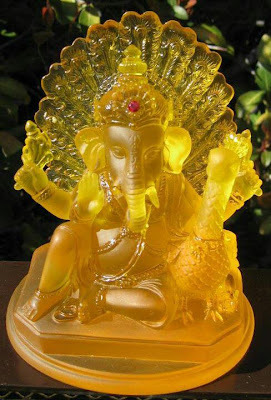 Lord Ganesha, who wears clothe-5 of white and yellow, personifies purity and uniqueness. With a deep knowledge of the self, he is the eternal spirit who is changeless yet causes change all around. Lord Ganesh is Punish, the Supreme Authority. He is the Omniscient Lord Almighty who rules over the entire universe. He is the Ultimate Reality, the One Truth, the Manifest Spirit. Lord Ganesha's body hue is compared to the red lotus and his tusk to the vermilion blood marks when it is thrust into his enemies for destruction. Lord Ganesha, the beloved son of Shiva, is the Master of all, whose virtuous qualities are orisoned by even the creator, Brahma. He is Shiva's revered and noble son. Lord Ganesha is the son of Lord Shankar and Goddess Parvati. He is the playfully deft son and is adored by his parents. He enlightens and causes his mother's face to blossom with love for him. Lord Ganesha is the Lord with large ears. These large ears serve the purpose of gathering information from all possible directions. Like a winnowing basket, His ears are receptive and attuned to every mortal's cry of woe or praise. A prayer to Lord Ganesha precedes all worship for he is auspicious and nothing can take place without invoking his name. For, he is the remover of obstacles in one's path, and the guarantor of success in. all ventures. The huge-bellied Lord Ganesha, with an elephant face, a single-tusk which is askew, has his body and clothes white, being worshipped on the shore of ocean of milk with white flowers. His face beams the beatitude. The chanting of Lord Ganesha's name will pay rich dividends in the form of being bestowed with success. The Lord is the bestower of the desired abilities. Lord Ganesha's huge pot-belly is symbolic of wealth and success. He bestows both on his devotees, being the kind and compassionate Lord who grants them boons and showers them with success. Ganesha is the older son of Shiva and Parvati, and brother of Skanda (Karthik). He is the destroyer of the asura's pride, and protector of the weak and helpless. He protects and loves his brother Skanda. His strange visage is in the form of 'OM', the sound symbolic of the cosmic reality. Ganesha, with the bulky body, stands for the cosmos in its entirety. He is the symbol of auspiciousness. Ganesha is the bestower of' all fruits of desire and granter of all adeptness that his worshippers seek. He is magnanimous and forgiving, being a wealth of knowledge and wisdom. The red-complexioned Ganesha is sometimes attributed with eight pairs of arms, holding a bow, arrow, goblin, spear, hammer, mace, pick-axe, serpent, banner, trident, discus, goad, noose, battleaxe, sword and shield - all signs of a valiant warrior. Vignahara is Lord Ganesha, who, like a vigorous wind, scatters away and destroys the dark clouds of evil. His name's mere recollection removes all sins. The askew-trunked Ganesha, also called Vighnanashin, is the destroyer of all impediments. He is the destroyer of darkness created by' Obstacles. Lord Ganesha, the most adorable one, adored by all gods, is endowed with a huge, monstrous body, symbolising unity of the primeval forest denizen with man - combining the physical energies of mortals. The pot-bellied, askew-trunked single-tusk Ganesha is popularly the beloved of all. He is the subject of those who sing his praise, the jewel from whose face flows nectar. Lord Ganesha is the fountainhead of wisdom, the Great God ' that Eternal Truth, that Eternal Reality. His name is chanted at the beginning and end of meditation at all times.